I don’t know if you’ve seen the posters already, but the Capped Crusader, Michael Moore, has a new film premiering here on Friday. 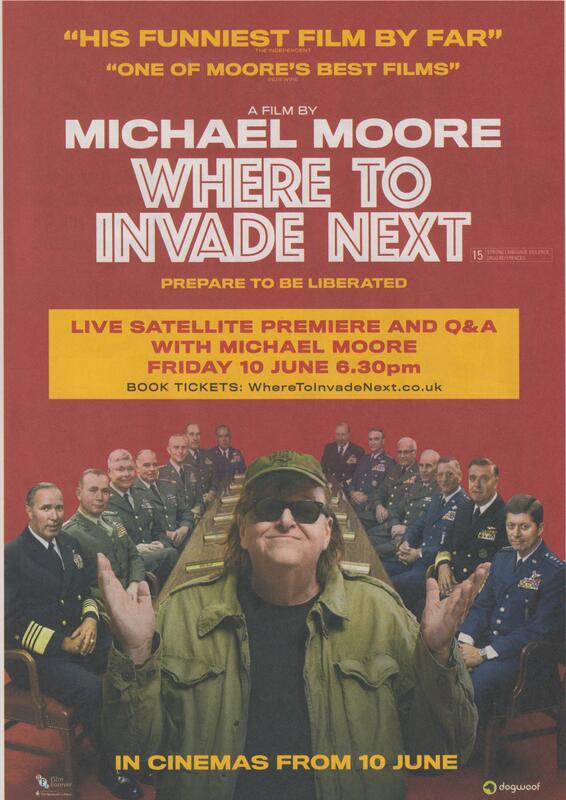 It’s entitled ‘Where To Invade Next’, with slogan ‘Prepare to be Liberated’. Here’s the poster. I don’t know anything about it, but my guess from simply looking at the poster, is that it’s about America’s wars in the Middle East, and the country’s long history of invading other countries to ‘liberate’ them, which in practice means the exact opposite: installing pliant right-wing dictators to keep the masses down and protect US corporate interests. Like the invasion of the Guatemala that overthrew President Alfredo Benz after he nationalised the banana plantations, which were owned by the US company, United Fruit. The invasion was sold to the American people as a necessary military action to free the country from Communism. Benz, however, was democratic Socialist, not a Communist, and the regime which replaced him was an extreme right-wing military dictatorship, which reduced the peasants on the plantations to virtual slavery. And that’s just one example from a long history of invasion and plunder going back to the 19th century and the war with Spain which gave the US, for a time, the Philippines and Cuba. Everything Moore does is worth watching, and Moore has rightly won awards for films such as Fahrenheit 9/11 and Bowling for Columbine. This one should no be no exception. I don’t go to the cinema all that often, but I’ll try and see if this is playing near me. This is another video on the lunacy and mendacity of the Republican party. In this piece from The Young Turks, they discuss Sarah Palin’s speech about her son’s assault on his girlfriend. Track Palin hit her in the face, then put a gun to his head, saying that he was going to kill himself. Clearly, Palin jnr. is a troubled, violent individual. However, in the speech Sarah Palin made about the incident, her son is not responsible for his actions. No. Like just about every Republican under the sun, when discussing anything troubling or unpleasant, she straight out lies, denies any responsibility, and claims its all the fault of Obama. And how is the President of the US responsible for her son’s attack on his girlfriend? Track Palin is a former soldier, and thanks to Obama, war veterans aren’t getting the respect they need. In the video the Turks discuss how this shows that Republicans, despite their rhetoric of personal responsibility, deny it when they personally are responsible for anything criminal or immoral. They also talk about how this actually undermines much of the Republican rhetoric defending the wars in the Middle East and demanding their further extension. Track Palin may well have PTSD. Thousands of veterans are coming back from the wars in Iraq and Afghanistan mutilated and traumatised from the combat. Yet they are given no help by the Republicans, who’ve done everything to cut back on the medical care, including psychological treatment, given to US soldiers. The Turks also make the point that this is actually a good advert against war and the army. If you don’t want to see young men and women come back physically and mentally damaged from war, don’t start wars. The Black panellist also makes a good point about the army recruiting school leavers. They state that when pupils are coming up to 18 or so, the army goes into schools and some of the lads are seriously tempted. The Turks’ Black anchor says he was walking around in flip-flops one day when he was that age, and the army recruiter stopped him and told him he could have a great time in the army. The anchor said that he thought flippantly, ‘What, can I wear flip-flops in a tank?’ This issue, the army’s recruitment of the poor to fight wars for the rich, is brought up and denounced by the ‘Capped Crusader’ Michael Moore in Fahrenheit 9/11. And clearly, nothing has changed here since that movie. They also show a Washington spokesman giving Obama’s response to Palin’s speech. They consider it a good response, as Obama states that veteran’s mental health isn’t an issue to be laughed off, despite Palin’s inept attempt to capitalise on it. So what you see here, in Palin’s speech, is Palin herself trying to blame Obama for her personal problems, and the Republicans trying to blame Obama for the psychological trauma to combat vets that they themselves have caused. And this is the woman giving her support to Donald Trump. The documentaries and commemorative articles screened and published this year about the outbreak of the First World War have repeated the claim that it was greeted with enthusiasm by the mass of the British public. I was sent this paper by Nick Jones a few months ago, and unfortunately have only just now got round to publishing it. It’s an important, eye-opening piece, as Nick argues that the general, jingoistic patriotism claimed by many historians did not actually exist, though there were local patches of support for the War. Reaction to the War seems to have been mixed at many levels of society. The Royal Family weren’t keen on waging war on the Kaiser, who was, after all, the king’s cousin. The ‘little bounder’ Lloyd George, as Nick shows, was ambivalent about the War. The Labour Party was split on the issue, between those who believed support for the War would make the party more electorally respectable, and those, like Keir Hardie, who continued their principle opposition. Nick’s article shows that some of the support for the War came from the gentry, and from particular commercial or bureaucratic groups, which saw a material advantage in the crisis. These included cinema chains, who used it as an excuse to open on Sundays under the pretext that they were supporting the war effort. Other organisations were equally cynical, but much more malign in their attitudes to the working class. These were the guardians of the workhouses, mental hospitals, borstals and labour colonies, who took the opportunity to reduce their inmates rations on the grounds that cuts needed to be made in anticipation of food shortages caused by the War. Some went even further, and forced their inmates to leave to join the army, thus reducing the economic burden of welfare expenditure for their ratepayers. Nick shows that some employers also used the same tactic to lay off staff by encouraging them to join the armed forces instead. There has, until very recently, been a general consensus amongst historians that the nation marched happily to war in 1914. A moment’s reflection might question this. The Royal Family may not have been too keen to enter a conflict against a state headed by one of their closest relatives. Kaiser William had also been a member of their Life Guards. It is not recorded whether he was issued with mobilisation papers after the declaration of hostilities. In political circles, opinion was divided The ruling Liberal Party was deeply split over the war. There was a near fatal split between the Parliamentary Labour Party and the ILP. Henderson, leader of the former, opted for participation in the war effort on pragmatic grounds, He thought that ‘Labour’ could show its fitness for government by collaboration with the ‘war party’. Ramsay MacDonald resigned the chairmanship of the Party when the Parliamentary section voted for ‘supplies’. Kier Hardie after voicing his dissent, retired to his Merthyr constituency and attempted to build opposition to the war from there. It is true that there was an outburst of ‘popular’ enthusiasm for the conflict in some quarters. “If the Rations of the Staff or the Dietary of the Inmates can be curtailed in any way without inflicting any hardships … no hesitation whatever should occur in carrying the same into effect”. All Local Authorities acknowledged that there would be problems of ‘distress’ due to the war [and prepared measures to deal with mass unemployment. Not everyone greeted the outbreak of hostilities with long faces though. One group of entrepreneurs welcomed the outbreak of war with open arms. The bioscopes, or Cinematographs were a relatively new form of entertainment. Like Music Halls, they were licensed by Local Authorities and had to observe strictly regulated opening hours. These prevented them from admitting patrons on a Sunday. One way in which they circumvented such restrictions was to offer ‘benefit performances’ for charities. The LCC’s Committee felt obliged to assess the effect of the war on attendances at cinemas. This was deputed to the London Fire Brigade. For the most part, audiences were down. In the East End, whilst a few managers thought sanguinely of affairs. they attributed any loss of business to the warm weather. Yet the majority bemoaned a loss of business. At the Variety Theatre Hoxton ‘Managers stated [that they were] doing fairly well, but [were] affected by large numbers of territorials called up. Managers who had regularly opened for business on Sundays before the War, quickly found a new excuse for doing so. On a more mundane level, it is remarkable how many young offenders were pardoned by Home Office Warrants during the latter part of 1914. Richard Van Emden has noted that approximately 150 ‘former borstal boys were known to be serving’ at the end of 1914. Poor Law Guardians and Workhouse masters took the opportunity to remove some of their ‘clients’ to the care of recruiting sergeants. He found some receptive ears. In fact this had been official policy since the declaration of War. A Relief Committee was set up under the chairmanship of Balfour. When the Cabinet had sought a vote for supplies in the House of Commons, it had included measures to alleviate any distress caused by the resultant unemployment. The Local Government Board, under Herbert Samuel, set up a formal Committee for the Prevention and Relief of Distress. Administered by an Education official Joseph Alfred Pease, it’s aim was to co-ordinate the various methods of Relief, including Charities and Poor Law Boards. 2. [M MacDonagh. London During the Great War, London, 1935. p.10. MacDonagh was the Times correspondent. It is good to know the Mail has maintained its veracity through the years. J.C.C Davidson recalled the occasion differently some years later; “Whitehall was simply packed with a seething mass of people…(after sending the Colonial Office telegrams relaying the declaration of war) “We started back to Downing Street, to find thousands of people milling around shouting and singing and bursting with cheers.. They didn’t know what they were in for, and they had this awful war fever..” quoted in R.R. James; Memoirs of A Conservative, London, 1969 pp.10-11]. 4. J Turner, British Politics and The Great War; Yale 1992. p.4; DJ Silbey The British Working Class and Enthusiasm for War, London 2005, p.20. 16. [[LMA ibid 4/458 7th Oct 1914; 10,981 Visit 29th August p.1]. / LMA ibid 10981 31st August p.3]. 22. [Pearce Comrades In Conscience pp 81-2 citing Huddersfield Daily Examiner 1.9.1914 Worker (Huddersfield) 5.9.1914] . 23. [ Circular No 3 7th August 1914 COS Archive; LMA/A/FWA/C/A3/49/1 between ff. 323-4]. So the image of cheering crowds, ecstatically greeting the news that war had come, is a myth. The reality was a deep ambivalence about the War amongst nearly all levels of society, and, for many, indifference. It was also cynically used by the nascent cinema to gain greater respectability, while employers, borstals and the managers of the workhouses and labour camps for the unemployed used it as a means to cut down on expenditure, either by reducing rations or encouraging their unwanted staff and inmates to join up. There are several parallels to the war in Iraq nearly a century later. There was wide opposition to the beginning of the War, with a million people marching against it. The present government has continued its campaign of welfare cuts, including laying off senior military staff, while simultaneously running recruitment campaigns trying to get more people to enlist. And as the Capped Crusader, Michael Moore showed in Fahrenheit 9/11, the burden of the War has fallen on the poor and working class. It is they, who have been targeted by the recruiting sergeants, while the rich and powerful, with the possible exception of the British Royal Family, have been keen to keep their sons and daughters well away from the frontline. And the mass media, the cinema in the case of the First World War, and the TV news now, have done their best to support and promote the War. It makes you wonder… After all the rhetoric about the War to End All Wars, what have we learned … what has changed over the past century?